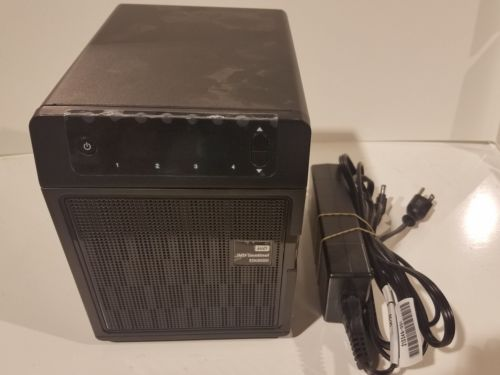 A couple of years ago I bought a Western Digital Sentinel DX4000 server. It's a Network Attached Storage device that runs Windows Server. It has served me well for the last 5 years, but it disappeared from my network from one day to the other. It turns out that the Western Digital Sentinel DX4000 has a common hardware failure: The network ports completely stop working. Of course I only found out about this issue after I lost access to the server. This wouldn't have been a problem if the machine had a video port, but because it's a headless server, once you lose network access you're in big trouble. The server runs Windows 2008r2, and doesn't ship with a lot of network drivers built-in and I hadn't installed any myself, so plugging in a USB network adapter didn't work :(. This left me in a pickle. I do take regular backups to a set of external drives, but I hadn't taken one with all the latest bits. While I didn't care about a lot of the data on the server, the photo archive is important. I contacted Western Digital, but they don't provide any warranty on the device and don't ship replacement parts (even if you want to pay for them). I contacted a data recovery company and they offered a data extraction for $900, quite a lot of money for 1 month worth of photographs. In the mean time I prepared a recovery USB key. The USB key only wipes the OS drive, so if it didn't work out, I'd still have other options. While waiting for the USB adapter to arrive I researched other options and found that the DX4000 drives can be swapped into another unit without them being wiped. I found a couple of second hand units on Ebay and saved them for later. You can find replacement devices for about $150-$200 on ebay. The ethernet adapter arrived... I crossed my fingers... Plugged it and the recovery key into the server and waited. After about an hour the server showed up quickly and disappeared right after... I almost started thinking this was going to be too easy anyway. But after restarting the server another time it came back up and stayed up. Turned out it had sucked in 2GB of Windows Updates and had been working on getting them applied. I quickly finished my offline backup and switched the server back off. Now I'm in the market for a new NAS. I haven't decided yet, the Synology DS918+ is looking very nice, fast CPU, 16GB RAM support, SSD cache as an option and it can run Docker containers... Should I? Or should I just spend the money on a couple of years worth cloud storage? Windows 8, Visual Studio 2012, Team Foundation Server 2012 and ALM Ranger Guidance now available! Windows 8 freezing issue resolved!